They feed on oak trees. Now that I think about it, I was under an oak when I saw one of these bizarre twitching purple monsters near my foot. There are white and red oaks (Quercus alba and Quercus buckleyi) at Bliss Haven but I haven't learned how to identify them yet. That's one of the big items on our list of things to do - a tree survey to plot their locations and special considerations. 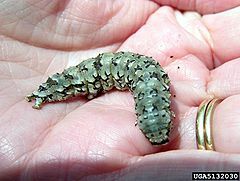 Once he's all grown up in May or so, this is what our oak leaf eating Lepidoptera will look like. This lovely moth is called the Ilia Underwing, Beloved Underwing or Wife Underwing, underwing being the colorful second set of wings under the outer wings (ilia is derived from the word for "flank"). 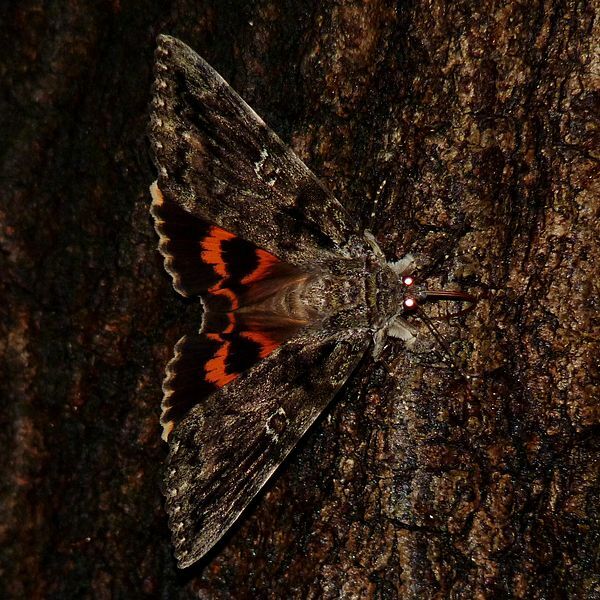 These moths are fairly large and fly in the evening; some fly for an hour or two at high noon.